The U.S.S. Enterprise is stunned when famed scientist Lynn Costa is murdered in one of the ship's science labs. She and her husband, Emil, were known as science's greatest ongoing collaboration and together had received the Federation's highest honors for their achievements in scientific research. Determined to see the culprit brought to justice, Captain Picard assigns Lt. Worf and Counselor Deanna Troi to the case. Their routine investigation of the ship's science lab soon reveals a dangerous web of deceit, betrayal, and madness. Not the best ST audio, not a wasted credit though! The U.S.S. Enterprise is chosen as the marriage site for a wedding that will unite two powerful rival families of the spacefaring merchant race, the Tizarin. But Captain Picard's happiness is soon cut short by the arrival of the Federation delegate from Betazed: Lwaxana Troi - the mother of the ship's counsellor, Deanna Troi. Despite Lwaxana's nagging presence, the festivities proceed smoothly until the arrival of the notorious and all-powerful being, Q - who has come to examine and challenge the human concept of love. 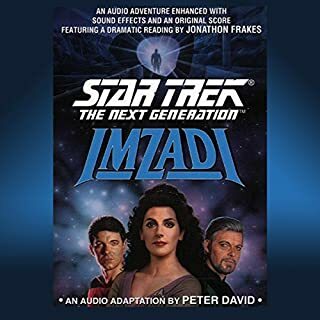 Suddenly, the celebration is in turmoil, the Tizarin families are on the brink of war, and Lwaxana is determined to teach Q a lesson in love that he will never forget. What would have made Star Trek, The Next Generation: Q-in-Law (Adapted) better? The abridgment of the book made this far too short and did the book a disservice. Having John de Lancie and Majel Barrett read the roles of all characters, as well as provide narration, was distracting. The music (intended, I assume, as dramatization of the story) was likewise distracting. The abridgment of the book resulted in the ending being far too sudden. I have read the book, and felt the audiobook's abrupt ending made the story seem juvenile in its presentation. I felt bad for author Peter David. Would you be willing to try another one of Majel Barrett and John de Lancie ’s performances? 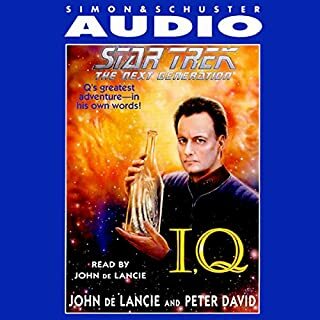 I would be willing to try another of Majel Barrett and John de Lancie's "performances" only because the number of audiobook versions of Star Trek books are surprisingly few, given the large quantity of books written for the different incarnations of Star Trek. What character would you cut from Star Trek, The Next Generation: Q-in-Law (Adapted)? The characters in the audiobook were not a problem for me. 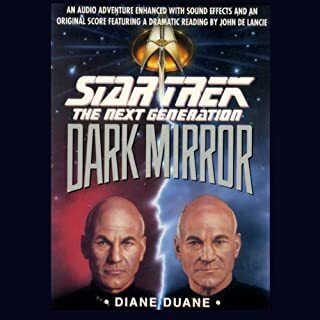 I purchased this abridged audiobook because there are, sadly, too few audiobook versions of Star Trek books. I much prefer unabridged audiobooks, and was very disappointed with the dramatization of this particular book. 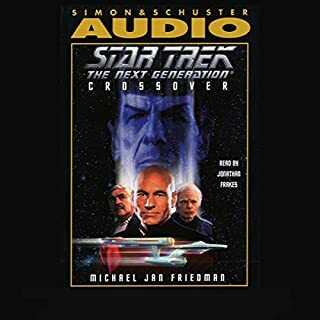 I would rather have unabridged Star Trek audiobooks made available and narrated without the distracting music and dramatization of the story. What made the experience of listening to Star Trek, The Next Generation the most enjoyable? Always enjoyed the tape version until my tape died. Glad I found the Audible version for my library. Laxwana Troi of course when she was ready to take the chain saw to Q! Which character – as performed by Majel Barrett and John de Lancie – was your favorite? The premise of this story is amusing, entertaining and will capture the imagination from start to finish. In this story, Q tangles with the formidible Mrs Troi and the trials and tribulations kept me laughing through the whole of the recording. Mr DeLancy, having played Q in the series, does a fantastic job with all the sarcasm and wit the character deserves and Madjel is nothing short of wonderful! I love Peter David... This book has a great sense of humor and excellent story plot. I highly recommend this book to all star trek fans that love Q and Luxanna troy. 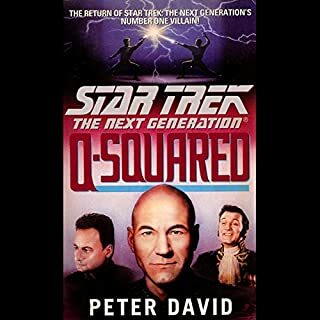 Almost 15 years ago I was obsessed with TNG and was browsing the novels and came across a book on tape called Q-in-Law the first thing that caught my eye was the cover there was Q and one Lwaxanna Troi and I thought, "now this ought to be GOOD!" I picked it up and never put it down! Tempers flare and lovers are spurned!! Don't miss two of TNGs most popular reoccuring characters battle it out head to head... can you guess who comes out on top??? At 90 minutes the book loses a ton of story (obviously). What makes this so much fun is they got the main characters from the book/show to voice their characters. Was like listening to an unaired episode of TNG. I absolutely loved the book , it was amazing , incredible and very enlightening to listen to . Absolutely loved this story. Mrs. Troy and Q have remarkable chemistry. Both with unquestionable power making them behave like spoiled children and getting their just deserts. (didn't want to spoil it). 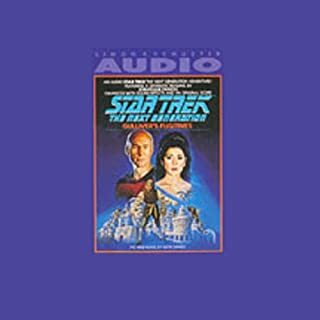 Would you consider the audio edition of Star Trek, The Next Generation: Q-in-Law (Adapted) to be better than the print version? I would prefer the printed version of this book rather than the abridged audiobook. I really enjoyed this audio book! It was a very whimsical and enjoyable read! It was short and sweet and left me wanting to physically read the book! Have you listened to any of Majel Barrett and John de Lancie ’s other performances before? How does this one compare? I've never listened to any other recordings by these performers. What did you love best about Star Trek, The Next Generation? I loved the show and the actors who portrayed the wonderful characters of Next Gen.
What does Majel Barrett and John de Lancie bring to the story that you wouldn’t experience if you just read the book? What can I say, I loved them on the show and as readers they brought the fun and authenticity to the story. I felt like I could close my eyes and see the story unfold as if it was actually on the screen and not just an audio book. Actually that is just what I did. I listen to audios while I work. Scanning files is pretty much boring. So this keeps me going. The better the audio book, the more I get done. With this book I sat and listened and worked the full length and was surprised it was over so soon. Why oh why did they have to Abridge this book? It's not that long a story to start with. Someone get the story put out in a full version. Please??? I have a very battered paperback copy of this but I liked it so much I also decided to buy the audiobook. Good if a little simple plot bought to life realistically as an audiobook. Highly recommended if you're a TNG fan. Funny in some places. Lighthearted compared to other Star Trek The Next Generation books. A quick enjoyable listen. It was interesting to hear all the characters voiced by two mainly know for a character each. As soon as Laxwan and Q turn up for the same wedding you know sparks will fly, and someone will be learning a lesson they might not want or expect. Very chucklable in places. The book is a light hearted romp through the 'Star Trek, The Next Generation' genre. Nothing remarkable, but if you like the characters included in the book, then you should enjoy this reading. What lets it down is the length. It could easily do with being an unabridged version. For that reason alone I have rated it lower overall.